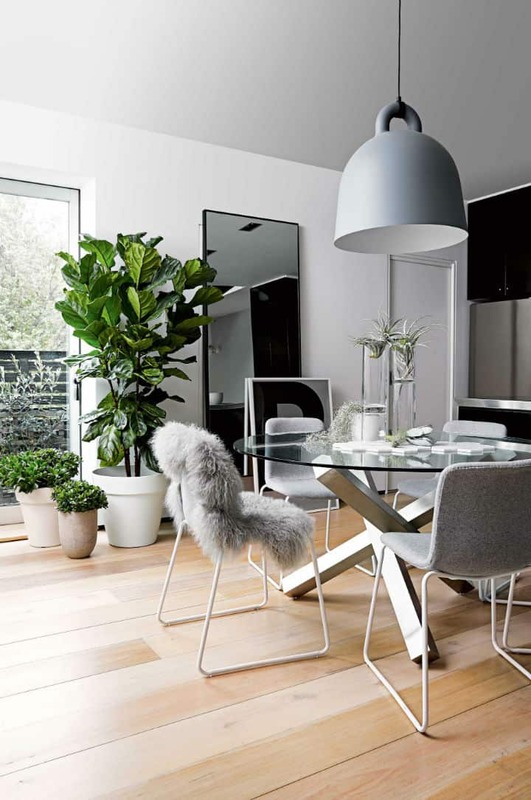 If you’ve been envisioning an ultra contemporary home then you may have already had your eye on one of these stunning designs. For a unique take on a traditional space, why not choose to nix the all-wooden pieces and go with something with more of a modern twist? 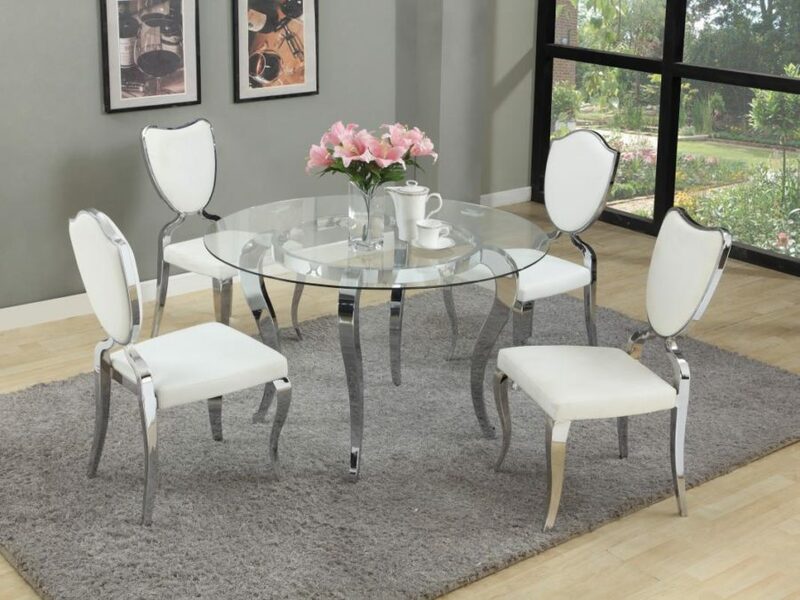 These 15 round, glass dining room ables will add sophistication to mealtime as well as punch of the fashion-forward energy inside of the home. West Elm always has really great pieces for the home, and this one is no exception. 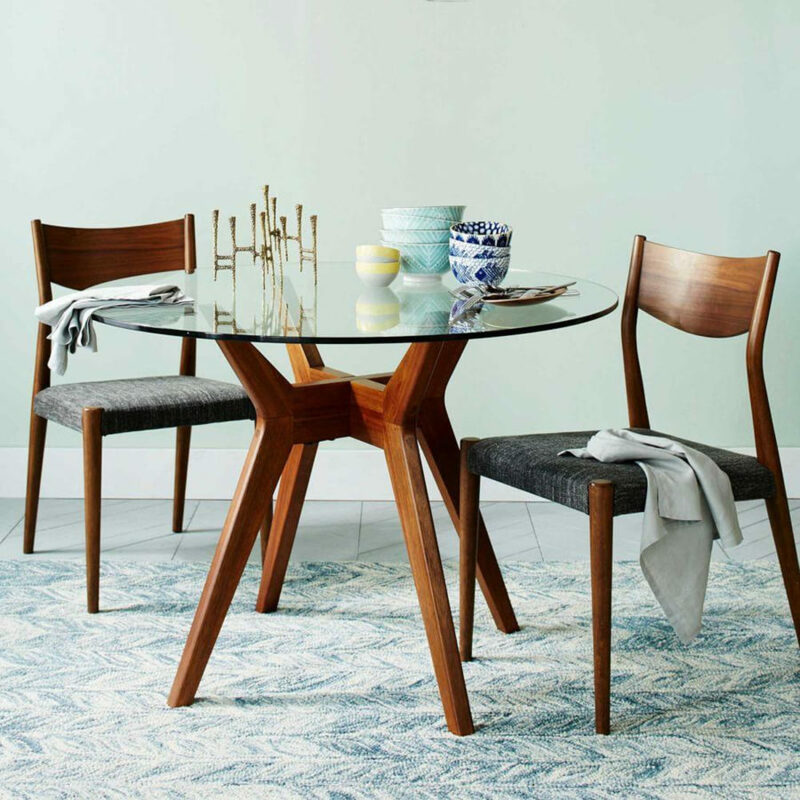 The “Jensen” round table makes for a quaint and cozy space to enjoy your meals but also one that’s been dipped in some mid-century modern style. The mixed material look also helps to round out the trendy vibes that you have your eye on. Here’s a simple piece we found at Houzz that struck our fancy as well. It’s chic, it’s no-fuss, and it easily fits in with an ultra modern and monochromatic scheme. Although it’s not the biggest of sizes, it will fit your small family or friendly entertaining needs nicely. If you want to combine tradition with a bit of modern edging, then this design from Prime Classic Design may just do it for ya. It’s got some delicate, flowing legs that make it feel a bit more formal and elegant than some of the other pieces on the list. 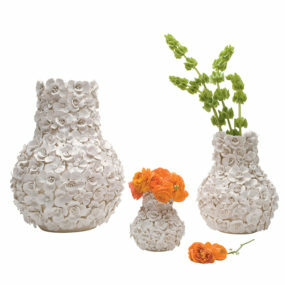 Adding a feminine touch to the house is easy with picks like this. Go Modern went with simplicity here too but one that was quite contemporary as well. This 3-legged design is a favorite among the pack because of its fashion-forward energy and minimalistic quality. It’s something that you can really personalize and style around easily. Homedit gushed about this beautiful piece and we had to scoop it up and share it as well. Mixing contemporary glass tops with a bottom that screams Victorian appeal, this is a unique choice that we’ve fallen in love with. 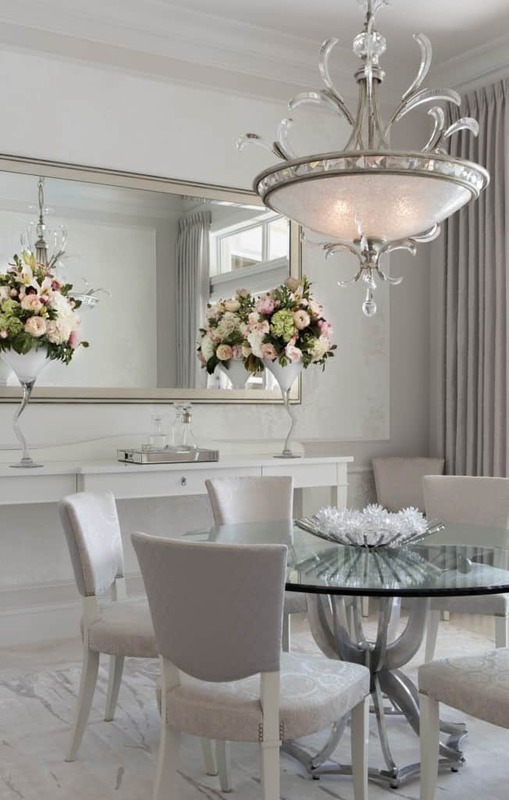 It’s grandiose enough to fit a full dining room and the mixing of interior design genres here is flawless. 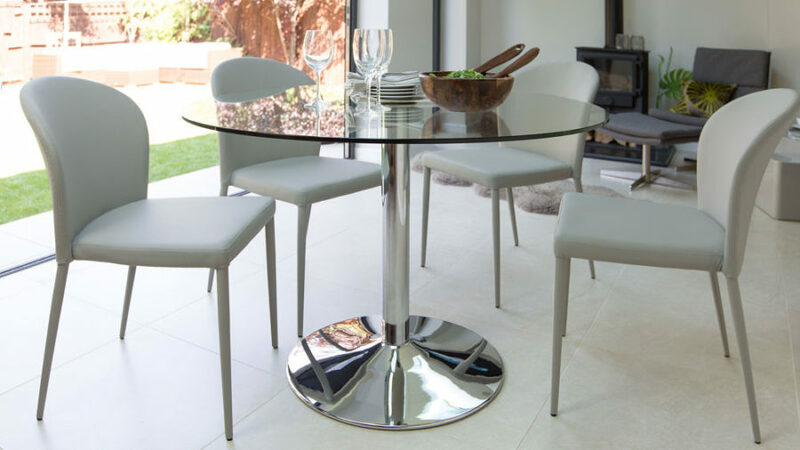 A bit larger in size but just as contemporary and cool as the others, we’ve fallen in love with the overall look of this round, glass dining room table too. It’s chic legs are fit for a modern art museum. 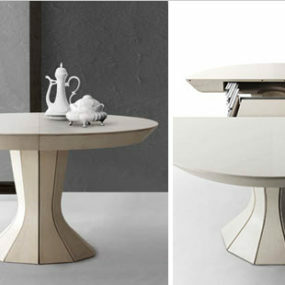 Take a look at more like this over at LA Furniture Store. Home & Garden Design Ideas gives us the most versatile design on the list. 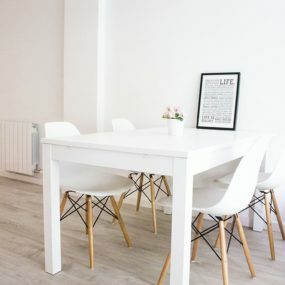 Used in minimalistic, modern, or even more retro scenes, this dining room table has the ability to fit within all kinds of home. It can also hold both larger or smaller chairs depending on your needs. Very similar to its predecessor, just styled a bit differently, this look from Style At Home is a scene stealer. This too can fit into a variety of setups and be styled in all kinds of ways. We were just inspired by this ultra contemporary look and wanted our readers to get a glimpse at this chic finished product. 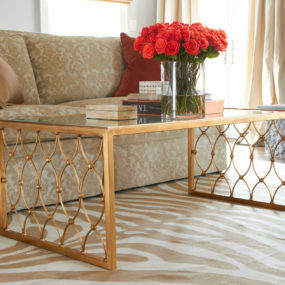 A personal favorite, this golden and glass design from Decor Pad is both functional and truly stylish. 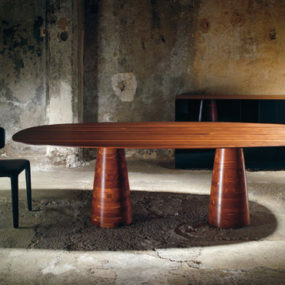 Displayed as a place where you can enjoy your afternoon tea, the table also acts as a sophisticated piece of art for the home. One of the more unique within out compilation, it’s a real beauty – and looks gorgeous paired with neutral creams tones. 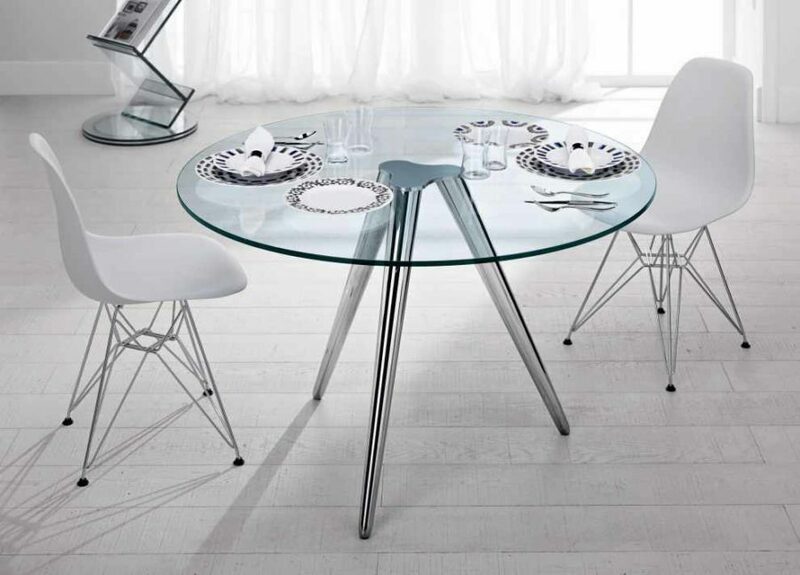 When it comes to glass tables, the beauty is really seen in its foundation. And that’s what you get with this Robb & Stucky piece. Just look at its base in all its artistic and innovative glory. 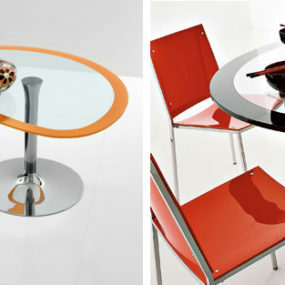 Acrylic legs work great with glass tabletops as well. We’re really love this piece from Wayfair, especially its addition of that golden “x” in its base. It’s chic, it’s feminine, and really quite versatile when switching up styles. 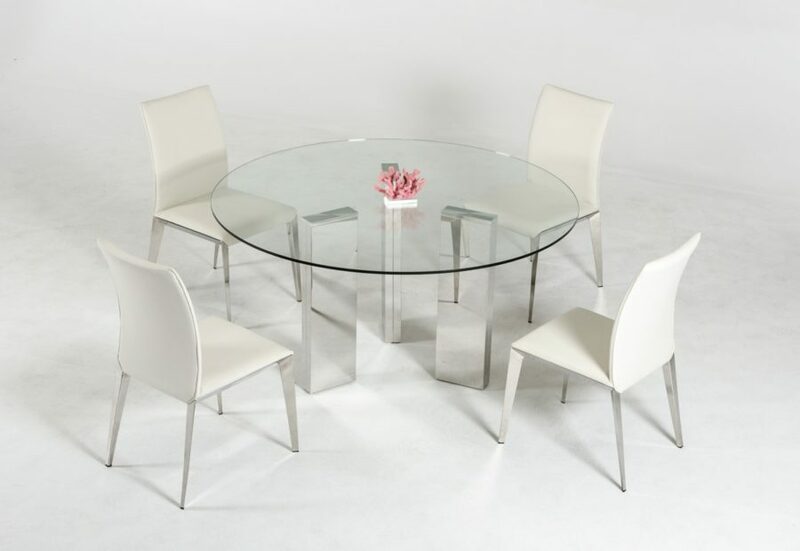 Here’s another round, glass dining room table that takes its base out of the modern art playbook. Not only are we inspired by this entire scene found at Decoholic but that piece in particular is such a beautiful way to infused both function and artistic focus into your home. CB2 offered up a gorgeous copper-inspired design that we’re loving as well. 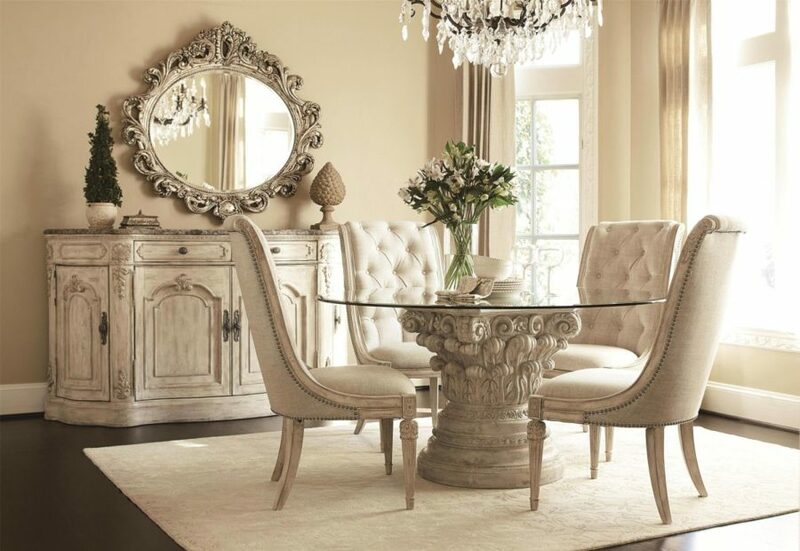 If you want to add a punch of uniqueness to your fashion-forward dining room, then think about adding a tone or metallic shade that isn’t as traditional. Paired with navy blue, it really takes on a trendy, stylish edge. 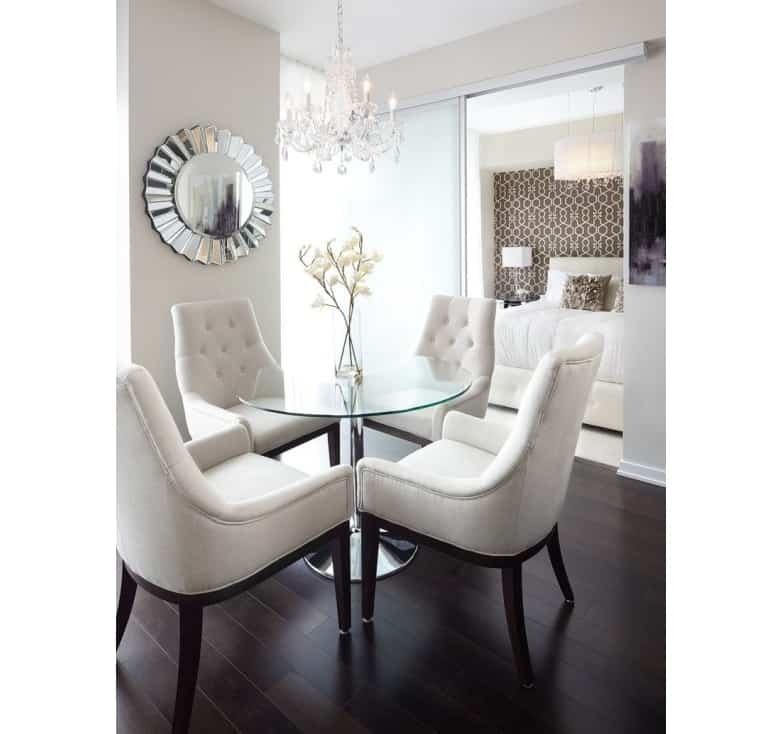 This piece from California Home Design is on the more contemporary and simplistic side. Although, it’s a bit more innovative in its base design – with all of those extra legs. Use this one in a home that has a vision for chicness and sharp lines. And finally, we leave off with this gilded beauty from Decor Pad. Again, we love when modern pieces of furniture take on the role of artwork for the home as well. Being able to combine function within your home’s stylings is the best.